This map shows how the concept of families and unattached individuals differs from the concept of households, i.e. a collection of people occupying the same dwelling unit. 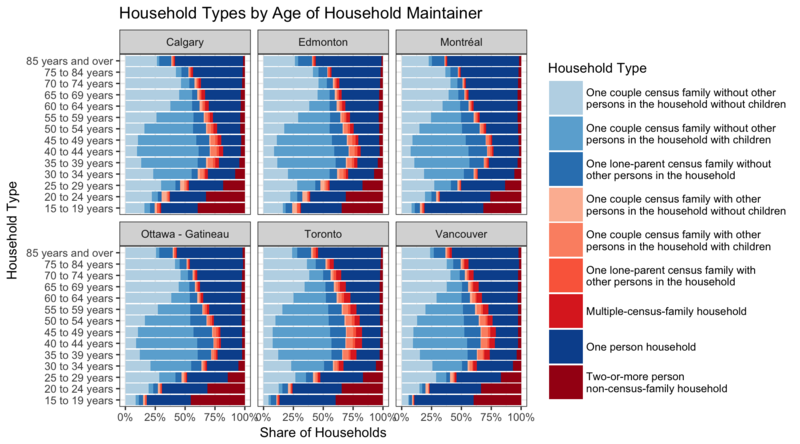 It colours each region by the ratio of the number of census families and individuals not in economic families to the number of households. In the census a private household is defined as a private dwelling, occupied by usual residents. When we look at how households are made up we see that in some areas households can be quite complex as can be seen in the following graph. The western provinces and territories of Northwest Territories, Alberta, British Columbia and Yukon lead the provinces in having overall ratios aboce 1.08, Newfoundland and Labrador forms the tail at below 1.05. While some rural areas stand out with rates above 1.15, notably Wood Buffalo CMA (Ft McMurray), rates tend to be higher in the population centres. Calgary CMA leads the way among the larger population centres at a ratio of 1.11, followed by Edmonton at 1.10, Vancouver at 1.09, Toronto at 1.08, Ottawa at 1.07 and Montreal at 1.05. Also consider the map of Families and Unattached Individuals and Adult Children vs Households that builds on the current comparison by also considering adults 25 and over that live with parents or other relatives as a separate economic family.